If you play a lot of video games, you might have noticed that water seems particularly difficult to render realistically. It looks even less realistic when there are solid objects that the water has to interact with or move around. 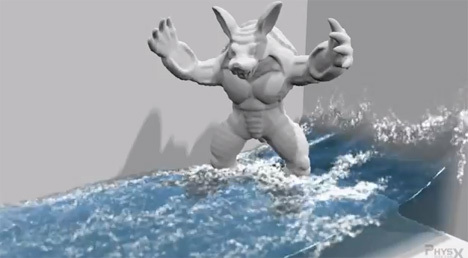 But a new fluid simulation algorithm called Position Based Fluids will very soon be making your video game ocean monsters look like they really are fighting it out in the water. A new paper on the subject written by Miles Macklin and Matthias Müller-Fischer details the algorithm and gives us normal humans a glimpse of what it’s like to actually do science for video games. For a living. Suddenly we kind of wish we were smart enough to be video game scientists. Instead, we’ll watch these videos a few more times, marvel at the realism, and then commence sitting around and waiting for the realistic water to make its way into every new game we ever buy from now on.